We look after both residential and commercial customers. If you need electrical work done, we are your professional local North Brisbane based electricians. Need a Brisbane electrician who guarantees to turn up or takes $50 off of your final bill? Established in 1988, ESP Developments is a multi-award-winning, custom building and renovation company. ESP Developments has completed a variety of projects within Brisbane and South-East Queensland and their company philosophies of professionalism and quality workmanship have been rewarded with a number of Queensland Master Builders’ awards. 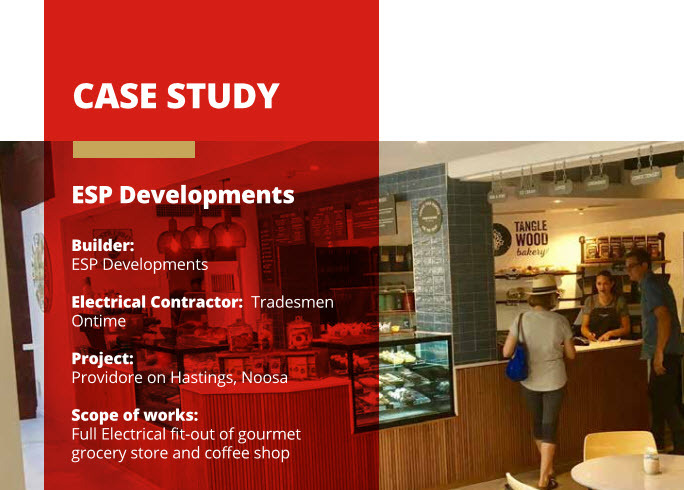 The Tradesmen On Time office is based in Everton Hills, in North Brisbane, and we specialise in delivering a friendly local Brisbane North electrician service for suburbs including Aspley, Chermside, Lutwyche, Toombul, Arana Hills, Enoggera, Samford and Upper Kedron. That said, we will happily travel to fix any electrical problem from South Brisbane through to the Redcliffe Peninsula. We look after electrical services for clients ranging from Bulimba to Bald Hills, from Brisbane Airport to Brisbane CBD and Kangaroo Point, from Dayboro through to Deagon. If you are not sure if we look after your area, just call us. No job is too small! Stay electrically safe & save money with our regular handy electrical hints and tips. TMOT regularly have special promotions and offers. Join our mailing list to receive our latest offers & practical tips.